After we spent the day in Pittsburgh back in October, we then had a long drive to Cleveland. I need to share our ride up the Pittsburgh cable incline too! Great shots! The Rock n Roll Hall of Fame was our next destination. I thought it was a place that Brian would enjoy and I don’t know what our future will bring (as stated in my previous blog entry), so that’s where we decided to go. We didn’t get in town until after dark and then had to go out to eat. We had the van drop us off at an Italian place downtown as I found a coupon or discount for it. They happen to be hosting some party and she said we’d have to wait. I said we could have whatever they were serving and the waitress said it had been served already. She did seat us and we got what we wanted and it was pretty good. The next day we had the van drive us over to the museum as it was so cold and windy right there on the lake. It was even flurrying that day. 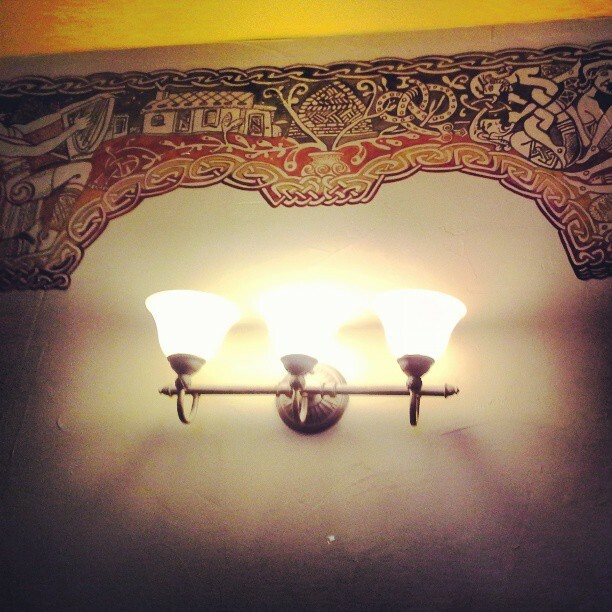 The museum is truly a work of art in itself! Sean posing with the late Johnny Cash’s tour bus. Not sure if you could go in it or not. We were so cold, we just wanted to get inside the museum! 2015 Nominees Including Joan Jett and the Blackhearts (a local gal from the same county that I grew up in) and Ringo Starr! Any Beatle memoribilia was awesome to us! The displays were so nicely collaged! You know I appreciated that! 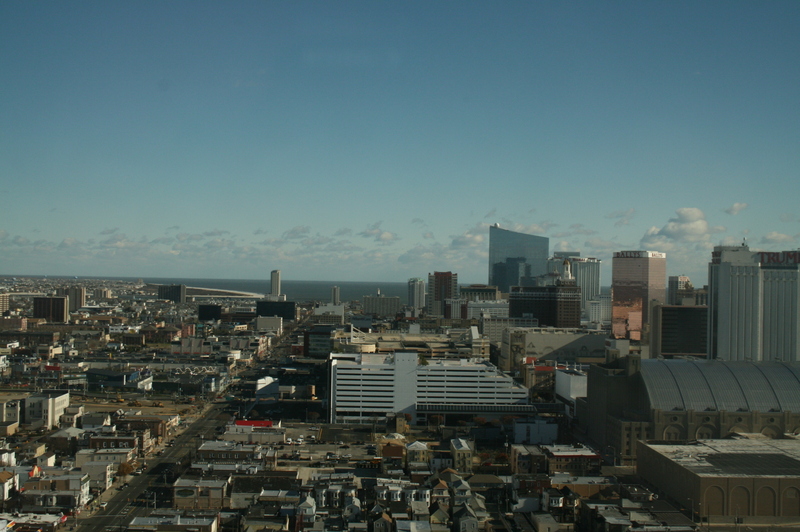 I took a photo of these for one of the posters….think it’s the Atlantic City one on the far right. Taylor Swift’s barely there costume and Lady Gaga’s meat dress that she wore to the Grammys a few years back. They said the cheap cuts of meat worked better. The lighting wasn’t great and I tinkered with many of my photos. Brian and one of my brothers are big Jimmy Hendrix’s fans. It was cool to see some of his psychedic costumes. He could really play the guitar! We were really excited to see this exhibit! Across from the Beatles were the other British invasion group, The Rolling Stones! This is one of my favorite photos of the Supremes outfits. You can even see where the sequins are loose. Sorry I have been MIA. I have had knee issues since I posted about the 80s flashback band last month. That night, back in the middle of July, we stood watching for over 2 hours. Afterwards, we located a geocache in a lamp skirt which I knelt to retrieve and must have twisted the ligament to the right of my left knee. I started to wrap it in an Ace bandage and even went to Urgent care about it as I thought it had to be worse than a strained ligament. 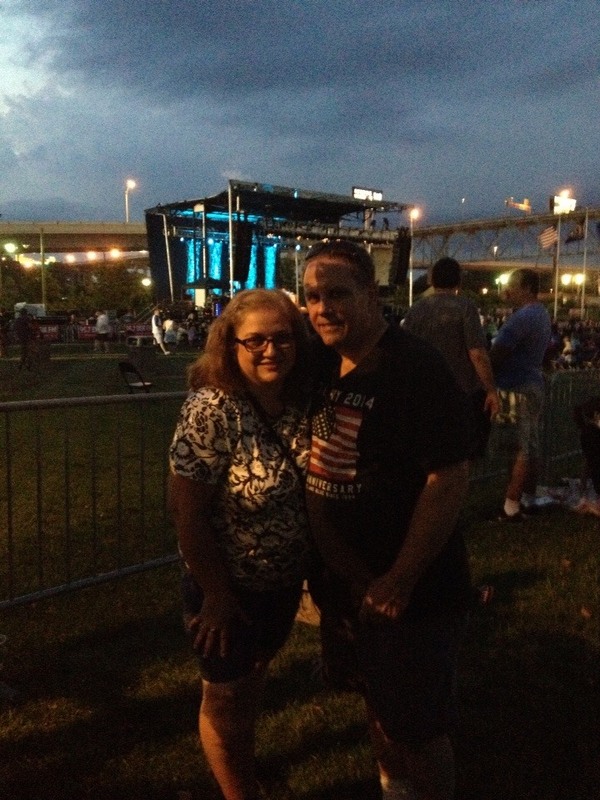 On August 2nd, we went to the Billy Joel concert at Citizen’s Bank Park, usually home of the Phillies. I had my knee wrapped and as we (Brian) crossed the street to the venue, I felt my knee pop! And the pain was awful! I debated what to do, but there was Gavin DeGraw, Billy’s opening opening act singing his heart out. We were at the 1st base area and needed to get to the 3rd base. I believe it took me a good 45 minutes to hobble there. Then I had to face steps and step over a few people. I look back at all that and do not know how I did it. 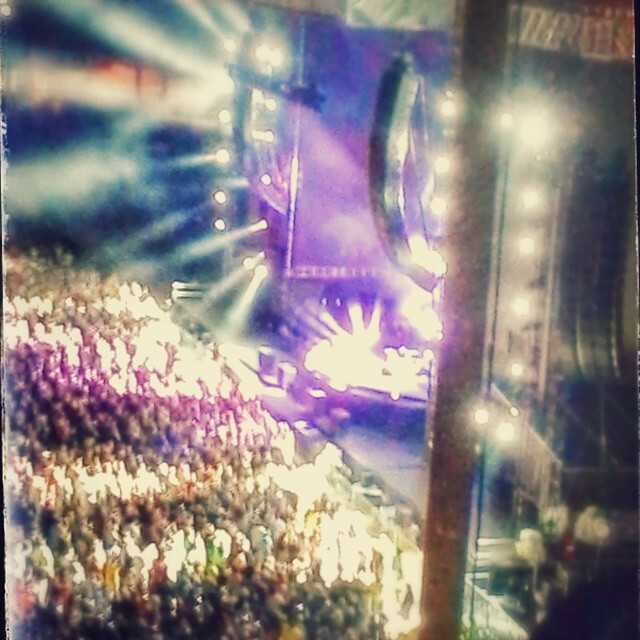 This was our view for the Billy Joel concert. I thought our tickets would have been a bit better since I ordered them in March and the price we paid. That is a yellow pole we looked around. So if was even rougher getting back to the car. We should have gotten a wheelchair. We walked right past the medic room. It was so crowded, I didn’t want to make a scene. I was in tears and had to stop many, many times. When we got home I was crying out in pain when I tried to get out of the car. I decided I could wait until the morning for it to get looked at. I learned to slide along when I had to go to the bathroom. Sean took me to the ER about 1:00 pm. 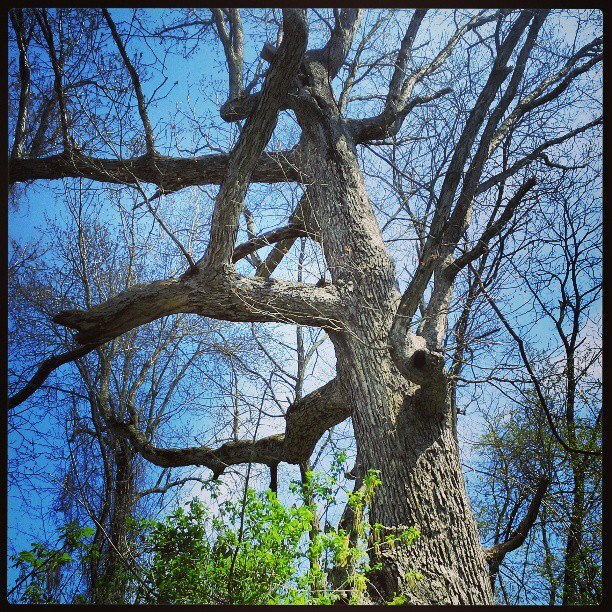 After x-rays, they agreed with the Urgent care, that it was a strain. I got ‘stabilized’ in a long leg brace and given a walker! I decided to go to the orthopedic doctor and he thought where it was hurting me was maybe a torn meniscus. They need to be operated on. Oh great. He ordered an MRI., The day before the MRI, we took a drive up to Hershey Gardens with my mom. I had gotten tickets that were going to expire. I had visions of both of us being pushed in a wheelchair. We did get one wheelchair, but I had to switch out with mom half way through! I was stopping in pain every 10 minutes. We had a nice lunch right at the gardens, so that was nice. I feel like I put a damper on the trip, especially when we stopped at the museum and both mom and I said no to the 45 minute walking tour. I will show some photos in my next blog post. It is a lovely place and next time I will be stronger when I go. So I had the MRI, just my lower half was in it and my head could be outside of it. I went back to the ortho doc and it should no tear, but a twisted or pulled ligament. I was really surprised hearing this as it’s so painful. I hope he didn’t miss anything. He gave me a shot and it felt better maybe one day, but it gets stiff and achy. The doc recommended physical therapy and I guess I will have to go for it. I decided not to go back to work with the kids at the church until maybe the end of September to the beginning of October. I am not strong enough to help out yet. I also have to go to a GI specialist on Sept. 9th. I had blood work in June and some tests were high. I have Lyme disease and the tick bit me right near my liver. I have been having elevated readings since 1998. The GP wants me to get checked out, so I asked for the best liver doctor in the practice. I certainly watch myself for symptoms of a disease. I have gained, not lost weight because of menopause.My arthritis is worse and my teeth have been mostly capped. I will be glad when that visit is over, but I won’t be surprised if he wants more blood work and a test. Rest in peace Robin Williams. My heart is still sad. Thanks for the laughs and sharing your incredible talent all these years. Since I have the laptop open, I decided to do another quick post tonight! It’s easier than the tablet too. So a concert called ‘Replay America’ was touring with Martha Davis, Patty Smyth, Naked Eyes and the Go-go’s! I had to look up some of the artists just to refresh my memory a bit, but after I did I thought it would be a fun concert to attend. Their music is still on the radio! 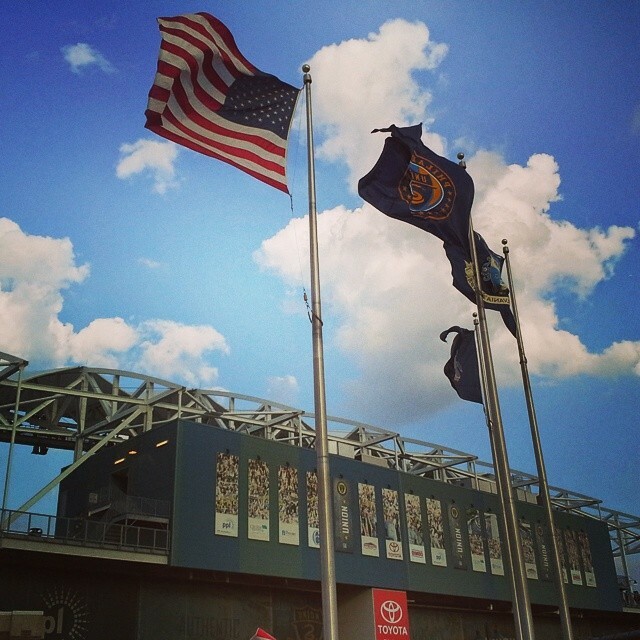 It was on the grounds of the PPL soccer stadium in Chester, PA. We had never been. I didn’t see where it said ‘grounds’ but Brian did and said to bring chairs. I didn’t listen to him and he didn’t push the fact that it would be a good idea, and he didn’t show me the website either. I’m thinking seats in the soccer stadium-no. We got here a little early and found a geocache right outside where we would be standing. As we walked toward the cache area or ground zero, another cacher was coming around the corner with his GPS pointed there! I said ‘oh a cacher’, pointed to the lamp skirt, and he grabbed it first. That was funny! He said there were a few others around the stadium. We got one more later. The lady from Reading took our photo at the venue. When the final act, The Go go’s came on, we moved to the other side of the venue to kind of beat the crowds when the show was over (Ya, they’ve got the beat-lol). That’s Belinda Carlisle in the middle. She is a year older than me and has great moves and her voice sounds the same. 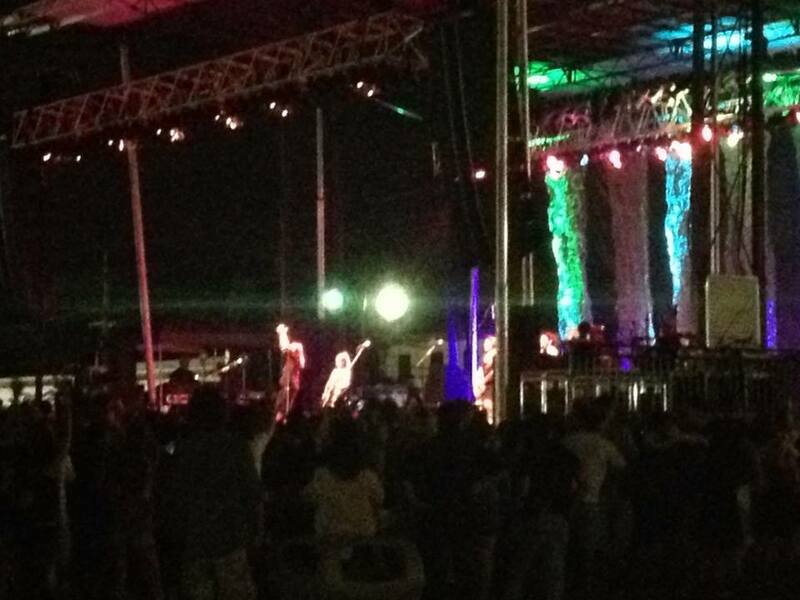 I really enjoyed Patty Smyth! She is the ex of John McEnroe and hasn’t been around for a while. I liked ‘I am the Warrior’. Everyone sounded great! One group pulled from the tour, Cutting Crew. I don’t remember them. Here is a link with some of the performers hits. We paid $17 each. Cant’ ‘beat’ that! 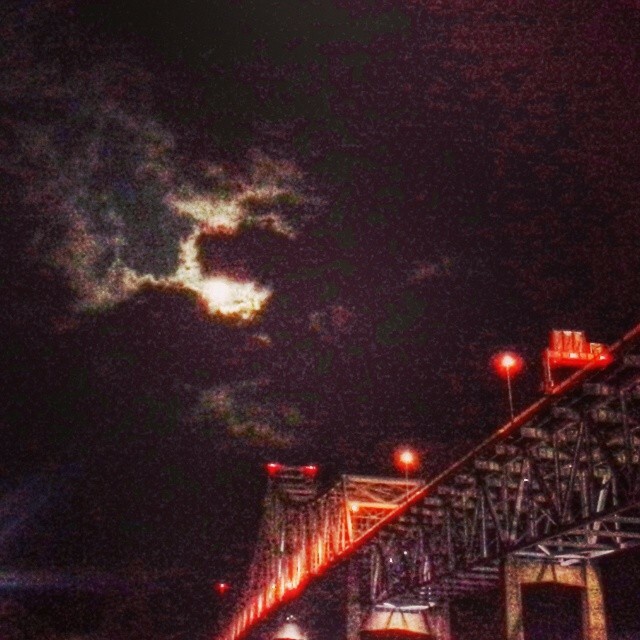 We were almost under the Commodore Barry Bridge to NJ, that was pretty neat. 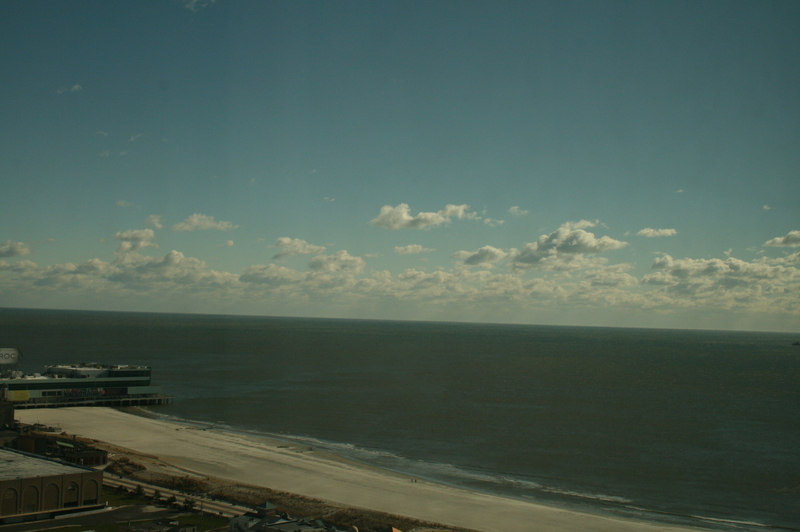 Last Saturday, Nov. 23rd, the three of us went to Atlantic City for the last ‘rah rah’ of 2013. I shouldn’t say that, because now I am scoping out places that will be decorated for Christmas like the home of President James Buchanan in Lancaster County. 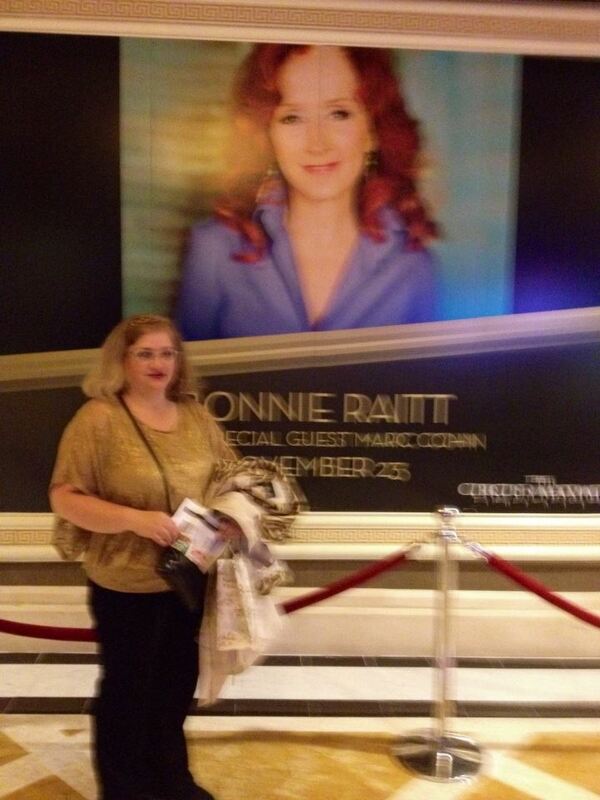 So the special treat was for Brian and me to go see one of my favorite singers ever, Bonnie Raitt. I even crocheted a scarf to give to her! 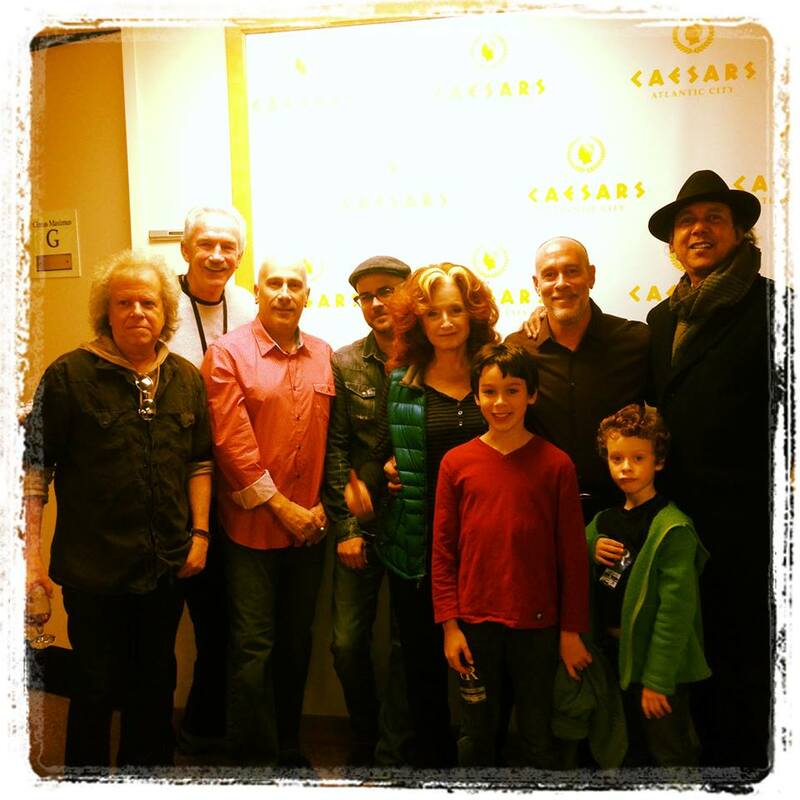 Bonnie was playing in Caesars and we stayed in the Tropicana for the 1st time. We have stayed in 5 out of the 12 now (actually the Sands was torn down, so it’s 4 now). Brian and I were told taking a jitney was our best bet to get to Caesars. We went and stood a few minutes in the cold and one came along promptly. We had a more interesting experience heading back. We bought a dinner and show package and had to find the restaurant. It was tucked in the corner of the 3rd floor. We both had Caesar salad and salmon. Brian chose cheese cake and me creme brulee. It was a nice meal! We had some time to kill, and went over to the mall which wasn’t busy at all. We looked around a few stores, but I was anxious to get back to the venue and see who I could give Bonnie’s scarf too. The ticket guys really didn’t know and it took a bit for them to check to see what to do. Finally I was to give the present to a security guard. We bet 2 whole dollars-that was it! Good for us! The theater wasn’t really large and we had good seat in the second row of the back section. Unfortunately people kept climbing over us! We had to stand up at least 7-8 times! Marc Cohn was the opening act for Bonnie and this was his last performance with her. I grabbed this shot off his Facebook page. Thanks for the memories Marc! Found this on youtube, but what a strange angle! I will treasure this evening forever! Bonnie sang ‘Rainy Day Man’ by another one of my favorites, James Taylor; Angel from Montgomery and so many of her new and older hits. The little boys above are the sons of Marc and his wife reporter Elizabeth Vargas. So we had a little trouble getting on the right jitney on the return trip. First we got on one going the wrong way. We thought they turned around maybe? Then the second one was the incorrect number for the Tropicana. So finally we got on the right one, got out and didn’t know how to get in the right area for the hotel part. We had to walk from the bottom level and finally found the right area to go. Sean was gone for a bit longer. He was having fun checking out the night life, but not eating a very filling meal. We never sleep well the first night and it was warm in the room. We had a difficult time getting up for breakfast, but I did grab the Canon for these shots. I’m sure that water was a bit chilly! Caesars is in front of that white parking garage. We have stayed there, the Taj Mahal and Revel, the place with the mirrored windows and the globe on the top. 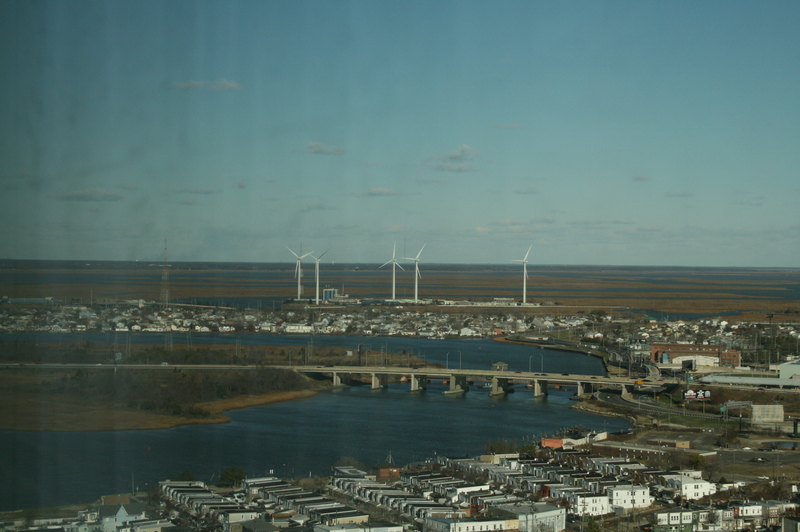 The lighthouse in Absecon (which I have climbed) is down the middle near the water-it’s a white dot here. 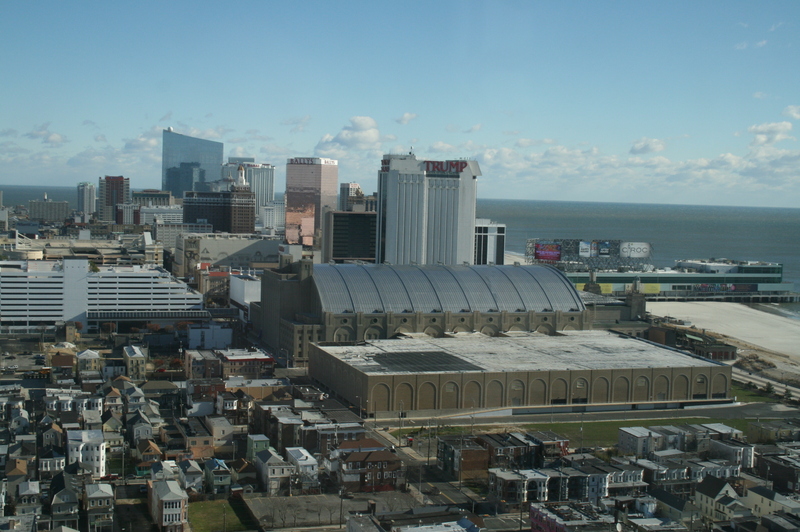 The curved roof building is convention center where the Miss America contest is now held again. 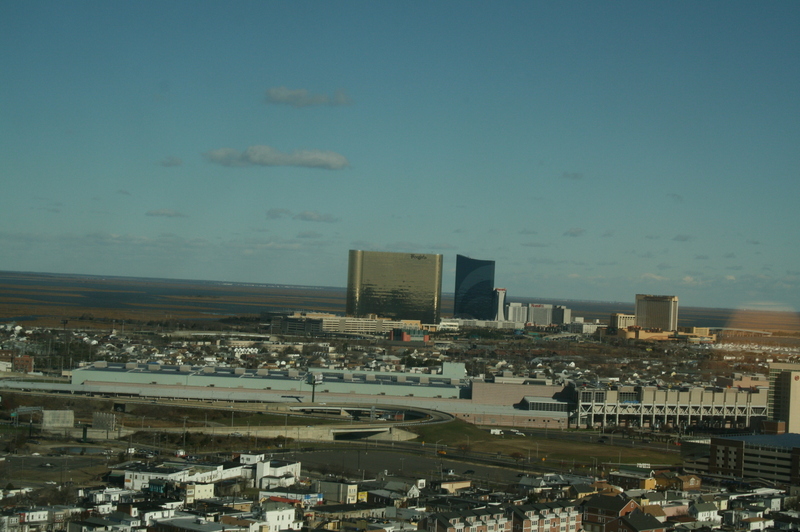 That’s the Borgata with the gold windows and the train station area (I think) and highway. They do use wind machines for power! 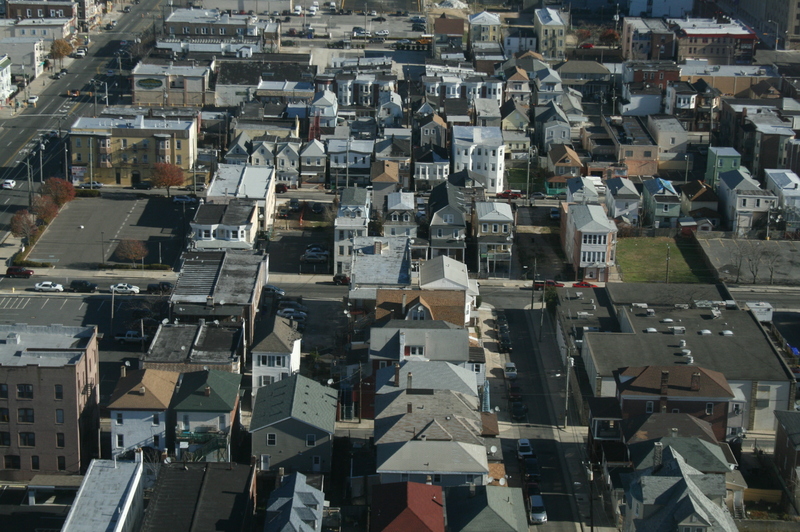 What Atlantic City looked like before the casinos. I remember we stayed in a place similar to one of these when we were younger. Not that great. When we were headed down, we stopped in Marlton, NJ where Sean works now. It’s really a haul for him each day. It’s good experience and if he needs to move closer he may have to as it’s 120 miles a day trip for him! We stopped a few times coming home, but I wasn’t in the mood to shop and actually snoozed in the car. Yep, it was a long night, but a memorable one. 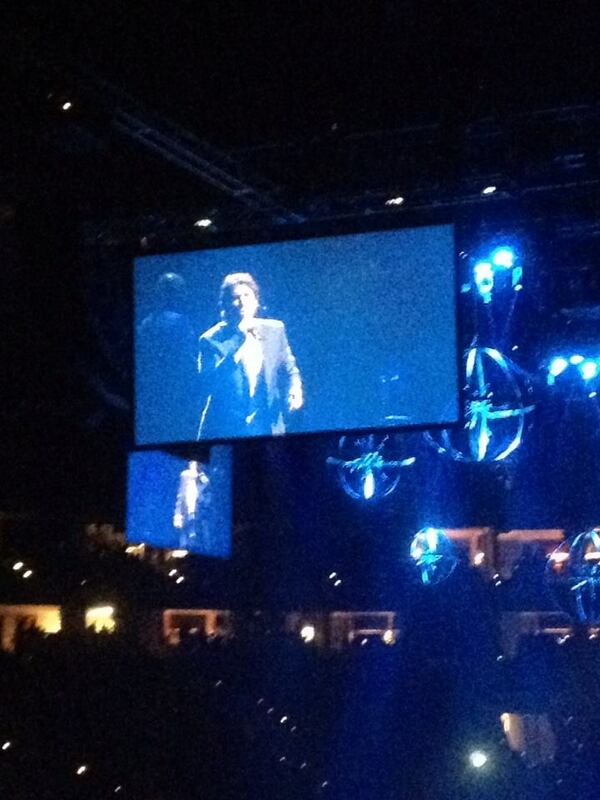 Every man should sing like Josh Groban! Really, I am not kidding at all. 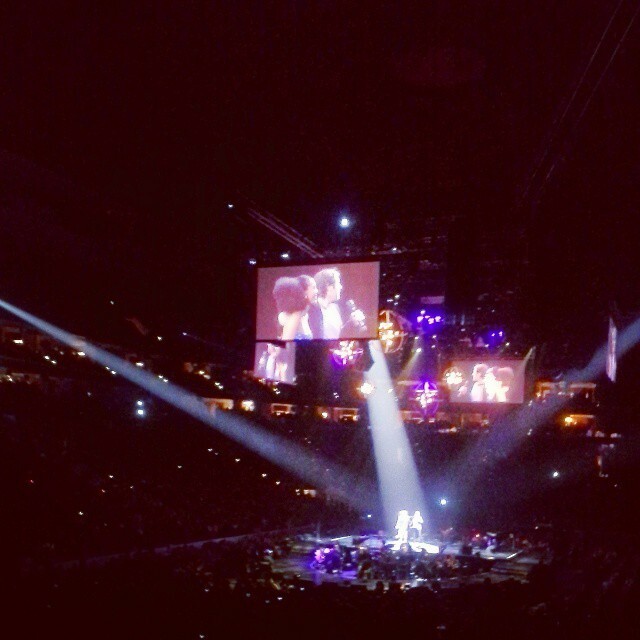 Can you imagine your hubby or significant other belting out ‘You Raise Me Up’ for your birthday or anniversary? I know some guys can sing, but how many can hold a candle to Josh? 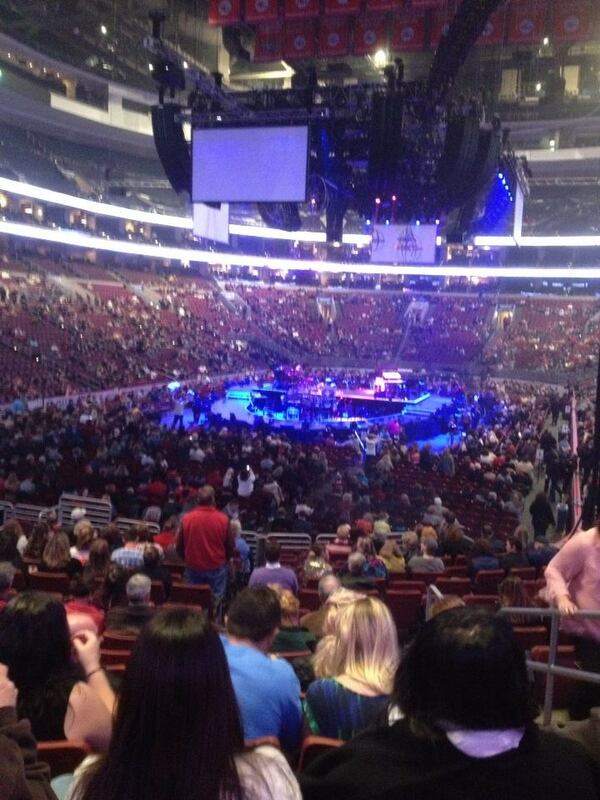 A Group-on deal came up to see Josh down in Philly-$25 each-holy cow, that’s the price of a concert in the 1980s! Brian and I decided to go. I guess it was like a date night. I knew it would be a low key crowd also. We left a few hours early which was a smart move. We got a great parking spot and no lines at the ticket booth. We had to wait to get in, but we didn’t feel rushed. The usher pointed us to what we thought was the correct row, and we made ourselves comfortable. Beyond the railing were floor seats. As I said, wow, not bad for the price. The big screens helped a lot! 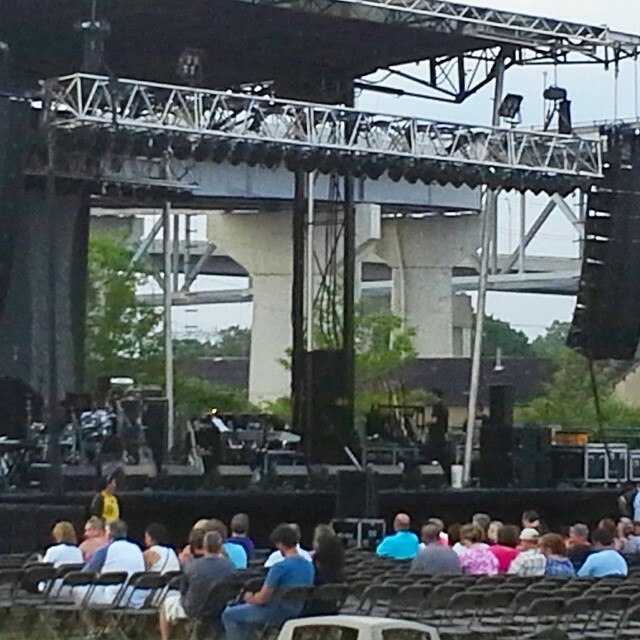 The opening act was a lovely lady named Judith Hill, I couldn’t place her at first. Here she was one of the finalists in last season’s ‘The Voice’. How neat is it to tour with Josh. She sat at a piano and sang a few snippets of songs, including ‘You’ve Got A Friend’. Woo, love a gal that sings a James Taylor/ Carole King song. She was on about 1/2 hour and then Josh didn’t come on until 8:30. Josh is only 32 going on 33. He has such a mature voice, you forget he is such a young guy. Here is Josh’s duet with Judith singing ‘The Prayer’. He said he was asked to sub for Andrea Bocelli (stuck on a plane)with Celine Dion at the Grammys one year which made him well known. He sang a nice array of songs, some in Spanish, maybe French. I was waiting for him to sing ‘You Raise Me Up’ and he did as an encore! That song makes me fill up as one time when my uncle was sick, it made me feel better and more hopeful that he would get better. We thought the show was over and I used the ladies room and he was singing ‘Smile’. I love that song too! All in all a nice evening except the man next to me was way too large for his seat and he really overflowed into my space. He should have turned toward his wife. He had a big beer and I knew he’d have to get up sooner or later and I made Brian change seats. Alas, he never sat down again! And here we were in the incorrect row! We should have been down one as the young ladies who were suppose to be in our seats came in late and I pointed to the ones below us. I wish we could have sat down there. Oh Canada! At last we meet, eh! Well it certainly was a week from hell. We will never know what those two brothers were thinking up in Boston, but I will not give them more thought than they deserve. I know 4 innocent people are gone and almost 200 injured. When the younger one got captured, we had a storm going through, and then sat in the dark for 3 hours. That was really strange. I was thinking just this past Wednesday how lucky I have been with not getting a cold for a few months. I was sitting in the car on the way to the preschool. A few nights before I had been in a crowded room with up to 30 people at one time. I watched the thermostat go from 67 to about 71! So on Thursday I woke up with my second really red left eye in a few weeks. Yesterday I went down and took my mom to a book sale, so I was around old books and pollen. Today I was walking around outside a little when the pollen count was 10.3 out of 12. I’m asking for trouble! I got it-post nasal drip, congestion and sneezing. Ugh. We went to our second geocaching event in a year Thursday, a get-together in a Chinese restaurant. We chatted with a few people, but you could tell which people knew each other better. We were given coords for new caches, but I didn’t have my device to plug them into it, and I don’t know how yet. We did go and find about 3 of them that were just in the area-easy ones! So when I went to mom’s, we went up to my hometown and we ate lunch in a place called Sligo’s. 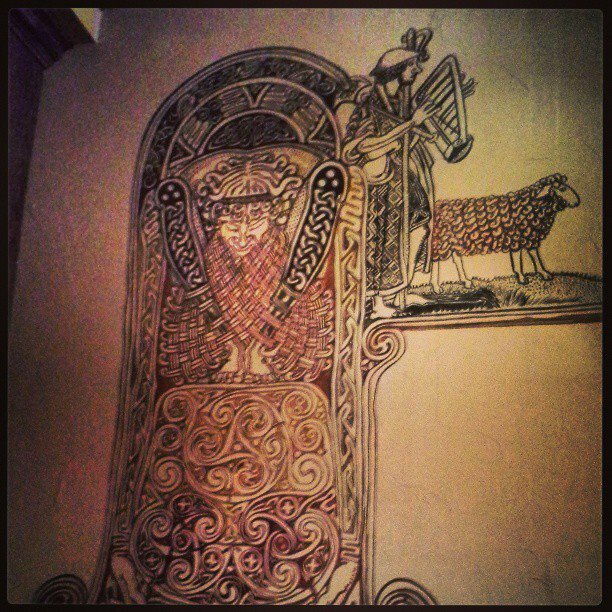 There was some amazing Celtic stencil work in there, so I took some photos of it. Today we went to church and after we grabbed a few hoagies at Wawa, I asked if we could find a geocache down the road (Delaware). We were lead near a big sign and it was magnetic. Lo and behold it was yet another cool reflector cache stuck to one of the metal supports of the the sign! It looked rather new and it was! I made a nice pork loin dinner tonight. The guys were both working late. Hate eating along, but Brian got in after 7. We have tickets to go to New York on Thursday to see the Rachael Ray show. I confirmed it-for the third time, but doubt we will go. They made it earlier to check in, so a friend who has seen it said to get there 2 hours before that! So we’d have to get up around 6 am, leave 8 or so, grab the 10 o’clock train and go stand and wait until 1:30 when they let us in the studio! And you are not guaranteed to get in after all that! Sean and I went to see a Philly show, got there late, were last in line and made it to the second row and on tv a few times! We got to see Phillies pitcher Cliff Lee and comedian Kevin Hart. We have no idea who will be on RR. Plus driving there (gas money to a train station in NJ) and the train round trip for two is $60. If we feel good, we may good. It’s really hard to get tickets to shows! I really miss NYC too.